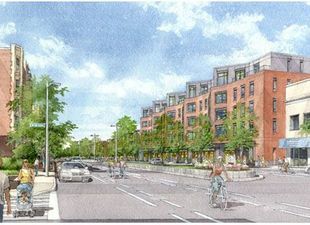 The Hamilton Co. of Boston has begun construction of a 40-unit workforce housing complex at Packard’s Crossing in Allston in the second phase of a $100 million development. The latest phase includes renovation of a Victorian-era home at 83 Gardner St. and construction of a new 4-story, 47,736-square-foot residential building with covered parking for 40 vehicles.. Monthly rents will average $2,700 to $2,900 per month for the two-bedroom, two-bathroom units. Hamilton Co. earlier this year completed the project’s first phase, a $20 million, 48-unit apartment building at 40 Malvern St. The $40 million final phase scheduled to begin next year consists of a 99,700-square-foot mixed-use development at 45-55 Brighton Ave.
“Our goal is to create a ‘New Boston,’ a more affordable place where individuals, families and businesses can live, work, study and thrive without the higher rents associated with other, more pricey sections of the city,” Harold Brown, chairman of The Hamilton Co., said at a recent groundbreaking. Hacin & Assoc. is the project architect. The Hamilton Co. owns 24 buildings in Allston containing nearly 1,000 residential units and 300,000 square feet of commercial space.